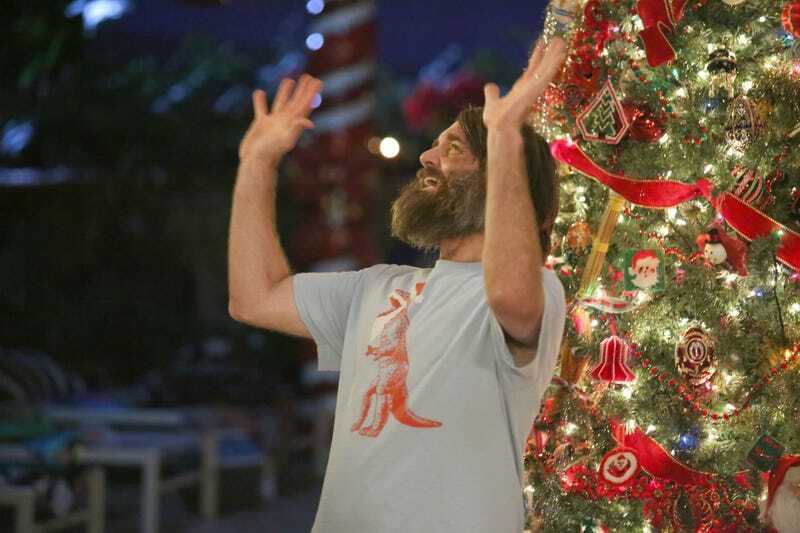 Armed with a billion dollar spending limit, the characters on The Last Man on Earth spent the latest episode conducting a little “Secret Santa.” That just so happened to be the title of the episode, too, and things went from awesome, to awkward, to incredibly sweet. To get everyone in the Christmas spirit, Carol decorated the house to such an extent, Gail said it looked like Santa Claus ate the Rockefeller Center tree and crapped it all over the walls. It was not a compliment, even though Carol took it as such. After everyone drew names, Tandy—who is still trying to win over Phil—gave him an early gift. Tandy had drawn Erica’s name and traded it to Phil, being as Phil was long overdue for some brownie points with his baby-mama-to-be. Tandy, in exchange, got his own name. Bummer. When the Secret Santa began, it started with Erica getting Carol’s name. She got her not only a chair from Oprah’s studio (did she drive to Chicago for it?) but Jennifer Lopez’s famous green Grammy dress. Todd drew Gail, his new secret fling, and got her a hot rod made famous by ZZ Top. Tandy got himself a yacht, which he decided to blow up because he could. Carol gave Melissa a pair of Jimmy Choo boots she wanted, but they were bedazzled. And though we all expected Melissa to freak out over Carol getting this wrong, she didn’t. Melissa is changing. We saw that in her gift to Todd, whom she broke up with last week. She got him a sash, scepter and crown because Todd never got to go to his own prom. Gail then got Phil, but didn’t get him anything and, finally, it was Phil’s turn for Erica. Tandy expected Phil to give her the Hope Diamond, which he had stolen and given to him for her, but Phil didn’t. Instead, he got her an ultrasound machine so she could see her baby. This was incredibly sweet but, classic Tandy, he was pissed at being stubbed by Phil yet again. The moment was so touching in fact, it made Melissa change her mind about Todd. She later got down on one knee and proposed to him. Just in that instant, Phil had something go wrong with him, he fell to the floor and the episode was about to end. Meanwhile, as all this was happening, Phil’s space-bound brother Mike was getting ready to end it all and blow himself out into space. He changed his mind at the last minute though but it was too late. The episode ended with Mike being shot into space tethered only by a small rope. “Secret Santa” didn’t have a ton of laughs, but it had really smart and fun writing with the gifts and a few nice cliffhangers as we lead into next week’s mid-season finale.